City of Brass Arrives In Steam Early Access | Nerd Much? It’s important to keep playing and as they say, get good. City of Brass, the hack n’ slash game from Uppercut Games, is out now on Steam’s Early Access for $20 USD. But the sale will only last until September 24, then the price will be $25. The Early Access version of the game has 12 levels for the players to climb up, with a procedurally-generated city, enemies, and traps. So each time you go in, it’ll be completely different (though how completely is yet to be seen) and you might even meet new enemies to contend with. 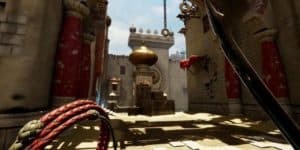 According to lead designer Ed Orman City of Brass has a lot of discovery and excitement to offer, with evolving tactics, gear, relics, and traps. You’ll never be able to anticipate too much, so it’s important to keep playing and as they say, get good. There will be daily challenges for the Early Access players, with which they have compete with others on the Steam Leaderboard. Uppercut Games is of course keeping a little of the game for the final version, to keep players wanting more. The final battle and mysterious prize at the end will remain shrouded in darkness until the game comes out in full. Be sure to check out the City of Brass’ Steam page for more information.